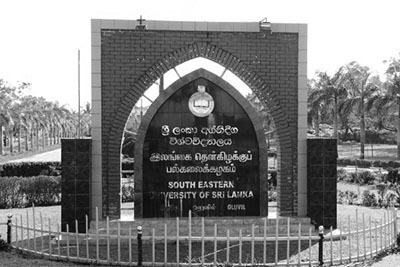 The Chairman, Department Procurement Committee on behalf of South Eastern University of Sri Lanka (SEUSL) invites sealed bids from Service providers with demonstrated professional competencies for maintenance and servicing of Air Conditioning units for South Eastern University of Sri Lanka. Interested bidders can obtain bidding documents from the Deputy Registrar/General Administration, SEUSL on submission of receipts issued by the Shroff of the SEUSL for payment of Rs. 1,000.00 as non-refundable fee until 9th October, 2017 between 9.00 a.m. to 3.00 p.m. on working days. All bids shall be accompanied by a Bid Security amount of Rs. 40,000.00 (forty thousand) to be valid for a period of four months from the date of closing of bids. The bid security should be obtained from any Commercial Bank operating in Sri Lanka approved by the Central Bank of Sri Lanka in favour of Vice Chancellor, South Eastern University of Sri Lanka. Bidding documents in duplicate, marked "Original" and "Duplicate" in two separate sealed envelopes, putting them together in one sealed envelope, marked "Maintenance and Servicing of Air Conditioning units for South Eastern University of Sri Lanka" on the top left hand corner of the envelop should either be sent by Registered Post to the address given below or deposited in the Tender Box kept at the Office of the Registrar, SEUSL, to be received before 3.00 p.m. on 10th October, 2017. Late bids will not be accepted. Bids will be opened soon after the closing time of bids at the Board Room of SEUSL. Bidders or their authorized representatives are allowed to be present at the time of opening of the bids. Further information can be obtained from the Deputy Registrar/ General Administration, SEUSL during working days (Telephone No. 067-2255177).